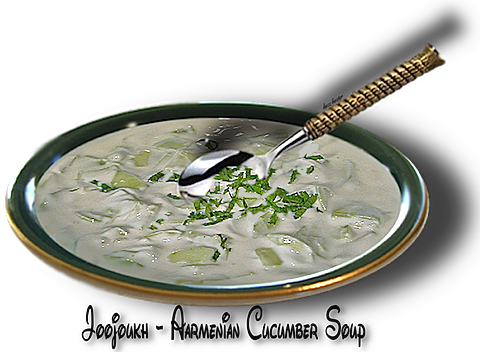 A refreshing cold summertime soup! ✸  Armenian cucumbers do not need peeling. Any other cucumber should be peeled and/or seeded. ✸  Armenian cucumbers “Gootah” are not really a cucumber,  but a melon. They are not bitter,  but sweet and yet taste like a cucumber. The seeds are usually soft and edible. like to garden,  try these,  I guarantee you will not be disappointed. They can grow to 2 −3 feet in length,   but I like them between 10 to 12 inches in length for convenience. ✸  If you like hot sauce,  this dish is greatly enhanced with your favorite red pepper sauce.